The stakes are high in this weekend’s Red Sox-Yankees series. That hasn’t been the case in recent years. On Sunday night, the Boston Red Sox and New York Yankees are playing their final game of the regular season, and the stakes are still high: New York is 4.5 games behind Boston in the American League East, and it’s also leading the wild-card race by 1.5 games. Boston needs to hold the Yankees at bay in the division, plus it’s jockeying with the Cleveland Indians for seeding and home-field advantage in the playoffs. When the season concludes in a few weeks, the results of this series, in which the Yankees have won two of three so far, could be a deciding factor in the AL’s playoff picture. Oddly, that’s been unusual for the Red Sox and Yankees of late. Given the hullabaloo surrounding this rivalry, one would think that the fate of baseball as we knew it hung in the balance each time the pair met. But lately these games have been pretty irrelevant in the big picture. We can see this by looking at The Baseball Gauge’s Championship Leverage Index (CLI), which uses the change in a team’s World Series odds to measure the championship implications of a given game, relative to an average opening-day contest.1 This year’s average Red Sox-Yankees game has been nearly 70 percent more important than that baseline,2 and that’s easily the most significant the rivalry has been in a dozen years. From 2007 to 2016, the typical Yanks-Sox contest was only about as important as any old opening-day game. In other words, it was fun but no big deal. 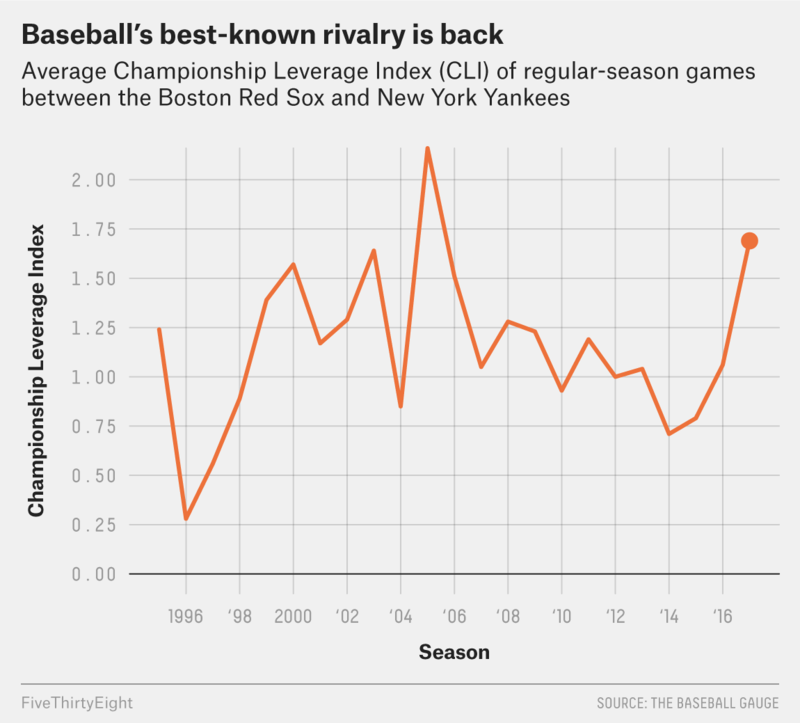 According to CLI, the Red Sox-Yankees rivalry reached its peak in the mid-2000s, when the two teams were battling for the AL East every regular season and occasionally in the playoffs — a faceoff we can’t rule out this year. From 2003 to 2006, 39 regular-season matchups between Boston and New York (or slightly more than half of all games in the rivalry for those years) were at least 50 percent more important than a run-of-the-mill game. In 2005, when the clubs tied for the division’s best record,3 the average contest between them was a staggering 116 percent more important than an ordinary ballgame. Those were the days when the rivalry most lived up to its bitter reputation. Oddly, the 2004 regular season — which gave us moments like the brawl between Jason Varitek and Alex Rodriguez — contained some of the rivalry’s least meaningful games of that era, since six of their 19 contests came in September, when both teams had already locked down playoff spots. They more than made up for those unimportant games in the playoffs, of course. But in recent years, Yankee-Red Sox games have tended to carry far fewer postseason implications. We haven’t seen both teams make the playoffs in the same season since 2009, as the Yankees missed out in three of the past four years and the Red Sox have been wildly fluctuating between great and terrible seasons on an almost yearly basis since their record-breaking collapse of 2011. In the decade from 2007 to 2016, there were only 28 games between the rivals that had a championship leverage 50 percent higher than an ordinary contest, an average of fewer than three per season. For comparison, an average of nearly 10 Boston-New York games per season hit that threshold from 2003 to 2006. Thanks to retiring legends, off-field drama and a drop in buying power for baseball’s richest teams,4 the Red Sox and Yankees went from the game’s finest feud to just another set of divisional games. This season, though, the rivalry is back. Boosted by a crop of impressive young stars on each side, New York and Boston have played more meaningful5 contests in 2017 than they did in the previous seven seasons combined. For fans who reveled in the bad blood between the likes of Pedro Martinez, Don Zimmer, Karim Garcia, Roger Clemens and Manny Ramirez, that means the glory days might come back soon enough. Indeed, our Elo ratings think this year’s Yankees are roughly as good as the 2004 edition was at the same stage of that season, and that the Red Sox are about halfway between the 2003 and 2004 versions, quality-wise. We may not be guaranteed to get the same playoff drama as we got in this rivalry’s heyday, but we’re already off to a strong start. Specifically, it uses the average opener during the two-wild-card era, which started in 2012, as a baseline. The Yankees won on a tiebreaker. Or at least, what appeared to be less of an advantage for rich teams. In recent seasons, there’s some evidence that high-payroll clubs might be making a comeback. Defined as a game with at least 50 percent more importance than the average opening-day matchup.